You are currently saying yes when you really mean ‘ No” or someone around you is making you feel that you’re loosing all sense of yourself , now the time to speak up. The Angels are encouraging you to be honest about what you want. You may be telling yourself that you don want a specific situation in your life, buts its time t be real. The questions what do you want? 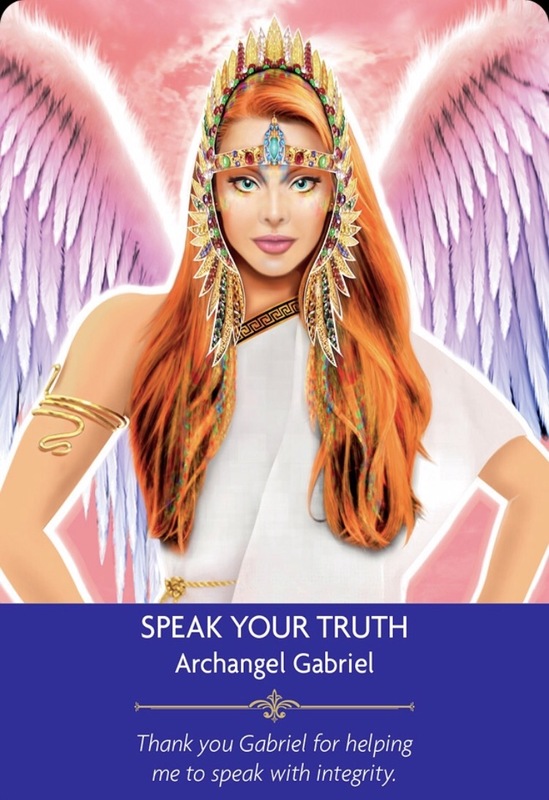 whatever your truth is, Archangel is encouraging you to speak up now! Gabriel is great for anything but she is particularly good to call on her when you may need help speaking your truth, being creative, becoming pregnant, children, journaling, sharing wisdom, being honest and when you need support being your most authentic self under pressure. She is wonder if you need support in the arts, or a presentation at work. Call upon Gabriel and thank her for supporting you. Archangel Gabriel’s name means ‘Strength of God’ & she is the angel of mothers & of communication. She is very loving & nurturing & she guides & cares for all God’s children. She helps us feel safe & supported in emotional situations. She helps us with creative writing. She helps us love & honor our inner child. She is the angel of children & fertility. She helps mothers & children during conception, pregnancy, & labor. She is the messenger angel & the angel of communication. She helps us be truthful with ourselves & others. She helps us speak our truth with integrity in our hearts. She helps leaders, speakers, & teachers communicate. She carries the trumpet of good news. She announced the coming birth of Jesus to Mary in the Bible. Archangel Gabriel, come to me & surround me with your pink & white, nurturing light. Help me move forward & speak my truth with integrity & love.Help me love & honor my inner child & view the world around me.. I now manifest & birth blessings & abundance for my life!